The 3.5km brought with it some welcoming drizzling rain as we ran up Macquarie St towards Art Gallery Road. Ellie and I would look at each other as to whether to walk or run. Usually the decision was unanimous, which was good as we then did not feel guilty about whatever pace we held. 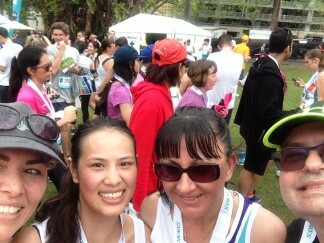 At the 5km mark, in front of the Art Gallery, was another drink station but there were toilets. So Ellie went and I waited. Later I found out that Roni tried to go these toilets before us and waited so long that she got frustrated and kick the door and kept on running. Why? Because she couldn’t let a 7 year old kid beat her to the line! Well I should have got a medal as I was the only one in the team who did not go to the toilet. The bladder always wins! It was here I tried an energy gel with water. The packet says the effect takes about 5 minutes to kick. Well we will see later if it does. Ok Ellie’s out and down to Mrs Macquarie Chair with the beautiful Botanical Gardens and harbour views around us. Also running along near us was a blind runner and his guide. It’s a very humble experience to know that there are many people who have their problems but today we are all sharing a common experience, (some feel the pain more than others). Well sure enough after about 5 minutes, I am starting to feel pretty good about myself! Hey Ellie let’s get the pace up. Things are going well for a while then near the 7km mark I can feel the effect going. I had only one packet to try. Let’s walk a little! 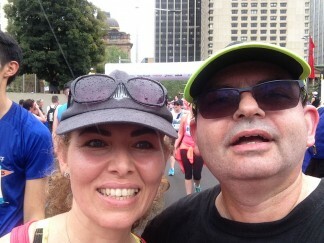 We are starting to loop back to Macquarie Street and start the run to the finish. We decide to sprint the last 500m to try and make up time. (Wishful thinking; I think us humans have got down to a fine art of kidding ourselves, but hey, it works for me). The finish at the conservatorium of music is in sight and now the sprint, which turned out to be only 200m. Over the line and we did it. The official distance 9.23km. The team all finished well. 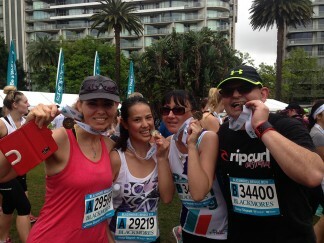 Kim with 59min; Roni 1hr 3min; and Ellie and yours truly 1 hr 11min. Off to the Recovery Village, for some freebies, and then to the Rocks for brunch. Well done to everyone and the ladies that gave up their time willingly to raise money for Wairoa School. The success of the run belongs to them. It was hard work but fun! We will do it again next year. Thank you to all who have donated, especially those who I have never met. Thank you to the patients who have donated at the surgery. A special thanks goes to Roni, who has helped raised money through her charm and been an inspiration in training and her dedication to the cause. Please donate to https://give.everydayhero.com/au/dr-anthony-seymour.